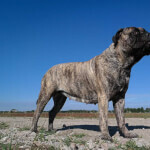 Bullmastiffs are huge, powerful looking dogs that came about during 1860s England when owners of game reserves and large estates needed protection. From a Mastiff and Bulldog this breed was created to be large, quick, strong and intelligent enough to be able to subdue a burglar without maiming them. Although they are huge dogs, they make excellent apartment or house dogs because they are relatively low energy and don't bark unless the situation requires it. In fact, ideally, Bullmastiffs will always be indoor dogs since they will affectionately desire your presence and will not be as happy (possibly developing bad habits) if left alone for the whole day. Members of this breed will be loyal and protective dogs to their owner or family and make perfect additions to households with children and other pets. They are not a hunting breed and do not display developed hunting instincts but can be trained to subdue intruders without injuring them. These guys are often described as independent thinkers and even stubborn, but truly they are very intelligent and eager to please you. It is imperative for you to take the time to train this breed and establish yourself as the leader from the beginning, gently but firmly. Besides some light hair cleanup little grooming maintenance is required, however, they are known to drool quite a bit. Besides the typical large dog issues of bloat, hip and elbow dysplasia, they may risk developing heart problems and some cancers. With routine trips to the veterinarian your Bullmastiff should live 8-10 years. 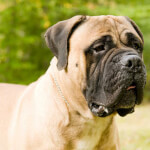 Below are details and specs for the Bullmastiff dog breed. Bullmastiffs are, overall, squarely built and powerful large dogs. They were bred 60% Mastiff for size and 40% Bulldog for agility and strength. Although well-muscled, they do not appear "ripped" or "bulky". Males often stand 25-27 inches and weigh 110-130 pounds while females are only slightly smaller (at 24-26 inches and 100-120 pounds). Despite their huge size, they make excellent apartment and house dogs due to their relatively low exercise requirements. Members of this breed are the perfect pets for families desiring a large dog. They are affectionate and gentle with kids, protective over the family, and reciprocative of the attention they receive. They make a fine choice for a multi pet household and have no inclination to hunt, chase or bully other pets. Bullmastiffs were bred to guard property from poachers and will be more suspicious of strangers than other pets. Friendly strangers may find this breed reserved at first but those with ill intent will find themselves quickly subdued. They will thrive as indoor dogs because being around their families is a must! Bullmastiffs are pretty much low maintenance in every aspect imaginable. They are easily groomed, require little exercise, and are capable of being extremely well trained. Although they are big dogs, they don't require much exercise and will do fine with a daily walk or some outdoor playtime. The owner that can be confident, consistent, and firm while keeping a cool, gentle tone will find this the case while others might find them too stubborn and independent. Note they also snore and drool and don't do well alone for long periods of time. The Bullmastiff came about when, in 1860s England, a dog was needed to guard game reserves and estates from poachers. They chose to breed Mastiffs for the size and English Bulldogs for the speed; this resulted in a breed that was large, imposing and intelligent enough to learn when to attack (yet not grievously injure) the perpetrator. This breed was so good at their job; they were nicknamed the "gamekeeper's night dog"; dark brindle was favored so they could blend in with the night. 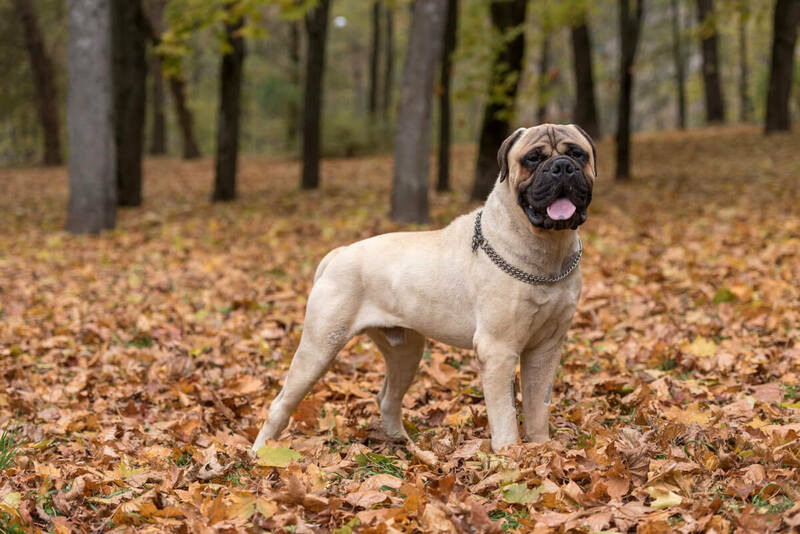 Later fawn coat with the black mask became the choice to guard estates and are now the vision that most likely comes to mind when one thinks of a Bullmastiff. They were accepted by the English Kennel Club as an official breed in 1924. The breed was accepted into the AKC during 1933 and remains in the top 50 breeds. Presently they are most often found as docile family companions rather than guard dogs and are now recognized by many registries such as the New Zealand, Australian and Canadian Kennel Clubs as well as the FCI. 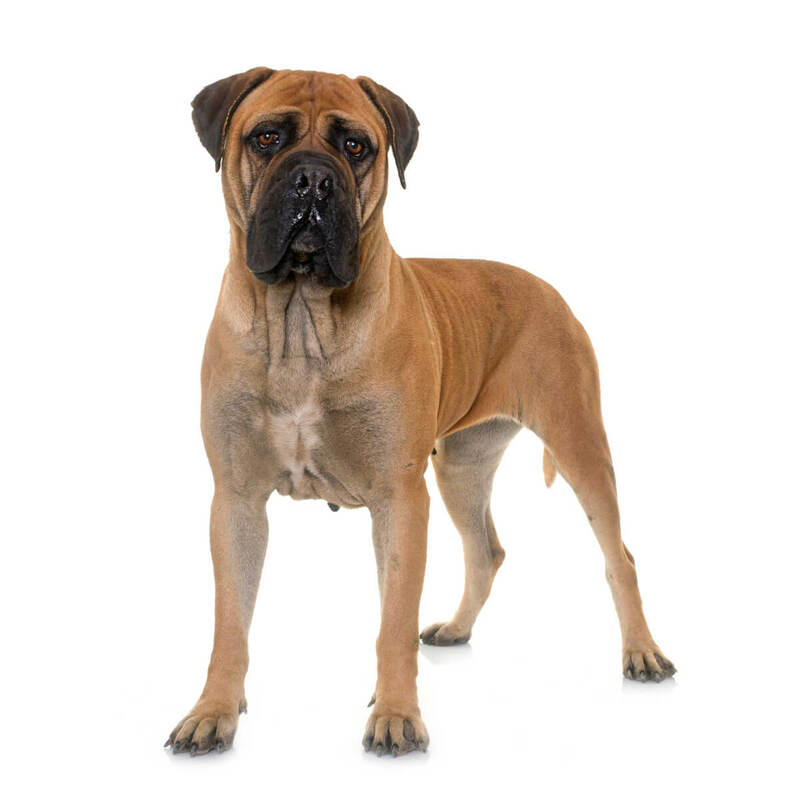 According to the AKC, the Bullmastiff was bred 60% Mastiff and 40% Bulldog. They are only very slightly longer than tall and so appear square and sturdy. Their overall impression should be of power and alertness; they are very capable of subduing a burglar, poacher, or anyone else that threatens his family. The coat is short and dense, making them able to tolerate cold and warm temperatures (but not very warm). Members of this breed are typically fawn or red, a mixture of both, and many have brindling of these colors. The black mask is very characteristic of this breed. The head itself also appears large and square with medium sized, v-shaped ears that hang next to the cheeks. 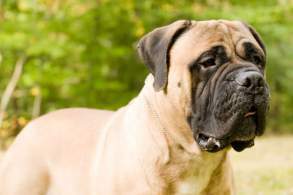 The Bullmastiffs cheeks are very well developed while the muzzle is broad and makes up 1/3 the length of the head; notably, the muzzle (as well as the ears) should be darker in color than the rest of the coat. The eyes are medium sized and dark. When the breed is alert wrinkling is well visible on the forehead. Both the neck and chest of the Bullmastiff are broad and thick leading into shoulders that are strong, but not overly muscular. Members of this breed have straight, well-built legs and well-developed thighs. The tail is set high and is thick, tapering to a point; it can be straight or curved. Bullmastiffs are generally red or fawn and can be a mixture of both (reddish fawn). They also can have brindling of the aforementioned shades. Dark brindle was preferable when these dogs were first bred as guardians due to their ability to fade into the dark night. A black mask is considered standard and they may also have white markings accompanying this. 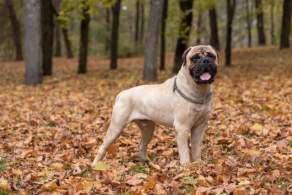 The fawn coat color with a black mask gained popularity over time and is now what comes to mind when most people think about the Bullmastiff. They may also have a fawn mask or black markings but, while not unusual, are not necessarily desirable in show dogs. Members of this breed are very large dogs and appear square in proportion and quite powerful. They were bred 60% Mastiff for size and 40% Bulldog for agility and strength. Although well-muscled, they do not appear "ripped" or "bulky". Males generally reach 25-27 inches at the shoulder and often weigh between 110-130 pounds. Females are slightly smaller at 24-26 inches shoulder height and 100-120 pounds. Surprisingly, they are lower energy, not requiring much exercise and will do well in an apartment or house. You can simply look at the Bullmastiff and tell its most cherished traits: brave, loyal and affectionate. They are calm and easygoing when indoors and will be interested in whatever you are doing. Almost every owner would agree they are fantastic additions to households with kids and other pets. Members of this breed are not hunting dogs; they were bred to protect property against poachers so they will be more suspicious of strangers than of other pets. Due to sheer size and impressive build, these guys are deterring to ill wishing strangers. Although, if need be, they have been and still are trained to subdue the intruder without harming them. Although bred to be guardians of estates and game reserves from poachers, this breed is not an incessantly barking or even loud dog. They fare quite well in apartments and houses but not where they have to spend large amounts of time alone. Their energy requirements are not much and can be met with a daily leashed walk or some outdoor playtime. Indoors, they enjoy having toys to play with. In regards to training, members of this breed need firm and consistent, yet loving, guidance. They are sensitive, intelligent beings that are eager to please you and will be deeply hurt if they sense your anger or impatience with them. Don't let their docile nature fool you, you must establish yourself as the leader at a young age or they will be stubborn and controlling. Well trained Bullmastiffs can excel at many things such as obedience, agility and even formation training as well as therapy work. Nearly every owner agrees that the Bullmastiff is a child's best friend. They are trustworthy and reliable, although you shouldn't leave very small children unsupervised due to their very large size-- they pose an accidental knocking over hazard. They are very loyal and will watch over children and, although they are protective dogs, will attempt to take care of any threats without injury to the other party. They also like to be in the company of their family/owner and will bask in the attention and affection children will give them; they will return that affection equally. Another consensus is that Bullmastiffs get along very well with other pets, even cats. They are working class dogs that were bred to guard estates and game reserves from poachers so they have little hunting instincts. As with all breeds, they will do best when socialized with these pets from a young age. This breed is arguably one of the best guard dogs due to their versatility not only to be a powerful, alert and loyal protector but to also be docile family companions. Members of this breed are reserved around strangers. Although they now mostly find themselves companion dogs, they were bred to guard against poachers. Even when in protection mode, they are typically trained not to grievously injure the perpetrator. They are not barkers unless the situation calls for it and they will warm up fairly soon after they are sure their owners are fine with the person. 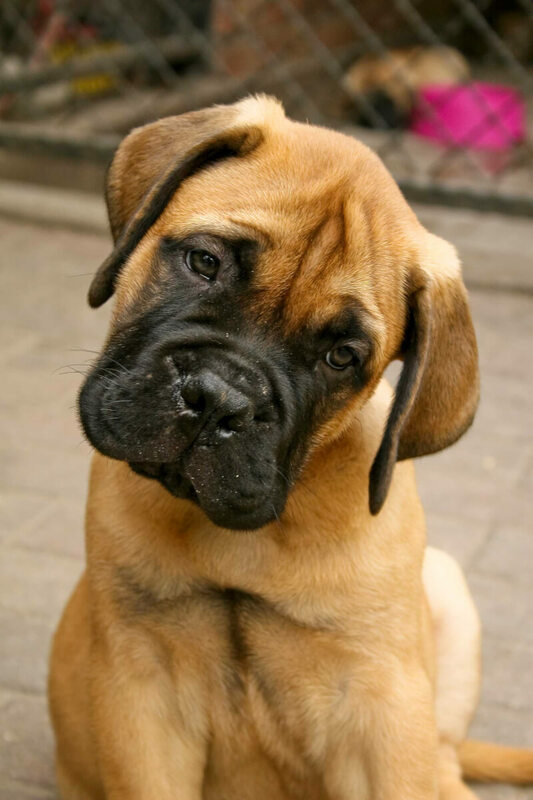 Below are pictures and images of the Bullmastiff dog breed. Members of this breed are quite low maintenance in all aspects. They require little grooming for their short, dense coats and are low shedding. They do drool and snore quite a bit! These dogs, contrary to what you may think based upon their size, need little exercise other than a daily walk or outdoor playtime. Although they do require your presence and enjoy doing the things you do and showing you affection, this is certainly not a chore. However, they shouldn't be left alone for long periods of time as this may lead to unhappiness and destructive behavior. Lastly, Bullmastiffs are intelligent, sensitive and eager to please you so they will learn remarkably well. The catch is that you MUST immediately establish yourself as the leader but do so firm, consistent yet gentle attitude; they are very sensitive to your tone and may become hurt and even obstinate if you cannot keep your cool. 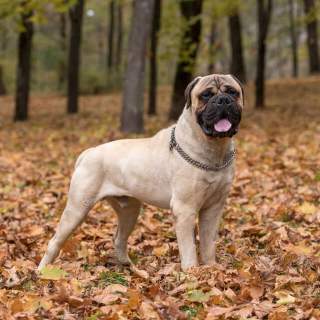 The coat of the Bullmastiff is short and requires little care. Make it a habit to brush them every now and again with a soft brush or even a comb. They are light shedders, and while they will not require a ton of cleanup but they may not be a good choice for those with dog allergies. You will likely be able to smell when this guy will need a bath and regular baths are encouraged. Notably, they do drool quite a bit. Other than that, teeth and ear cleaning, as well as nail trimming, is all that's required. Contrary to what you may think based upon their size, they don't need a ton of exercise. Indoors they will be calm and well-mannered and somewhat inactive, however, they will greatly appreciate toys to keep them occupied. Although large and well-built, Bullmastiffs are capable of excelling in agility, conformation and therapy activities. Obviously, they are also good at carting and tracking. More often than not, though, they're quite happy with a daily walk or outdoor playtime as long as they are around the family. 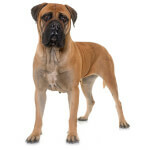 Your Bullmastiff will ideally live indoors around you and the family. Contrary to how they may appear, they don't need much space or exercise. Their affectionate, sensitive nature makes the priority only to be in your presence...and protect you. Although they may snore and drool, they are not barkers unless need be. This is not the breed for you if you want a dog to live outdoors or to be OK with spending a lot of time by itself. 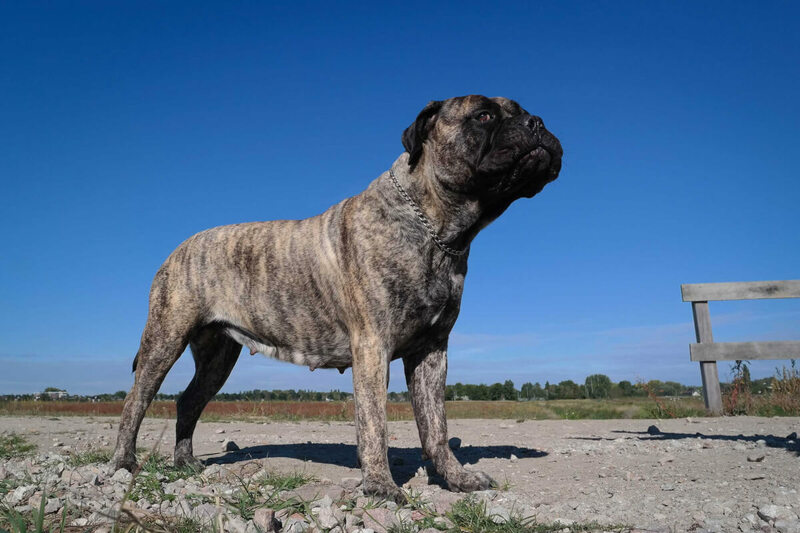 The short, dense coat allows the Bullmastiff to thrive in both warm and cold temperatures. They don't tolerate extremely warm temperatures well, however. They will, ideally, be indoor dogs so temperature is not necessarily a deal breaker. Hip and elbow dysplasia, along with bloat, are typical large breed issues. Never let a large dog get in the habit of "bolting" their food. Minor issues for this breed include hypothyroidism, entropion of the eyelids and retinal atrophy. Cardiac issues, kidney disease and multiple cancers such as mast cell tumors, osteosarcoma, hemangiosarcoma and lymphosarcoma, may also manifest during their lifespan so regular trips to the veterinarian are a must to aid in detecting and preventing such diseases. With good diet and good company, your Bullmastiff should live 8 to 10 years.